Four years ago we released a collection called "Autumn Harvest". The collection contained popular design elements like pumpkins, scarecrows and leaves. The collection was extremely popular over the years and we decided to revisit the theme with a different artist and new art. The Autumn Harvest 2 collection is full of beautiful designs. 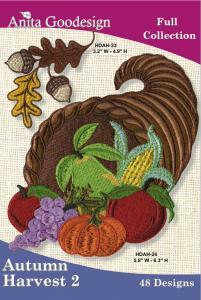 There are five different applique leaves in 2 different sizes, as well as falling leaf scenes. There are pumpkins, Jack-O-Lanterns and two different scarecrows. There are 48 different files in all and the designs will look great on garments, accessories and home decor projects.